Reserve Making More Memories Today! The dryer didnt work after we had addressed it with other reviews, mildew in both bathrooms, lots of cob webs in the upper beams, dirty windows inside and out, cigarette butts in driveway, and no animal proof trash can. This was the 2nd time in this cabin and the 1st experience was great 2nd wasnt a bad stay just need things worked on! Great cabin - location worked well for us and the cabin itself had (almost) everything we wanted. Would definitely stay here again. There were a few things that kept it from being all 10s, but they did not ruin the experience. The mattress in master bedroom was not great. My wife & I had a hard time sleeping the first couple nights. A tip for anyone using the hottub, when you walk out the back door, the hottub is on the right - on the left down low is a breaker box - when we got there we couldn't figure out why the hottub would not turn on ... the plastic on/off switch was pulled out and sitting on top of the breaker box, just needed to open the box and pop that switch back on. Only other thing was there were no oven mitts - besides that kitchen was well stocked with pots/pans for our Thanksgiving cooking. Also, if the electronic dart board is a selling point for you (it wasn't for us), there was only one broken dart - either bring your own or see if they've replaced them. Pool table was all good. My husband and I thoroughly enjoyed our stay at this cabin. It was very clean and the beds were comfortable. We especially enjoyed the hot tub on the back porch. It was totally private and secluded with only woods behind the fire pit. Overall I think this cabin was great. Loved how it was kind of secluded and didn't have any neighbors right on top of you. Plenty of privacy. My only issue was that there was not any extra blankets, found an extra pair of sheets and more than enough pillows. The master bed mattress needs replaced. Took 5 hours to dry six towels that had been left in dryer from the previous renter or housekeeping. The big picture windows front and back are in need of a good cleaning, makes the cabin feel dirty. Everything was great except the dryer took all day to dry a load of clothes. The only problem we had was the WiFi. It was down and only had one bar in and out to work with on our phones in that location. We connected to the router but said the internet was suspended. On our 2nd morning there, direct tv had delivered empty boxes at the front door. Everything was nice and pretty clean. Would stay in the same cabin if I had some internet. Overall this cabin is nice. Secluded away from any neighbors which was a plus. However, they didn’t do a very good job cleaning the place after the last people. There were cigarette butts in a pile in the back yard, kinda disgusting. I think someone before us broke something because there were glass pieces right next to the stairs in back so that should be cleaned up. Also didn’t do a very good job of cleaning the bathrooms. There were dust bunnies in all corners of each bathroom. Found a stain on the master bedroom sheets. Overall our stay was nice. Great location with not too steep roads and nice forest feel all around you. But something needs to be done about the cleanliness of the cabin. Not very good. The cabin was wonderful except the dryer didn’t work well at all. The beds and furniture was very uncomfortable and needs updated. The cabin was clean and secluded. We loved the property. Hold times for reservations is way to long. 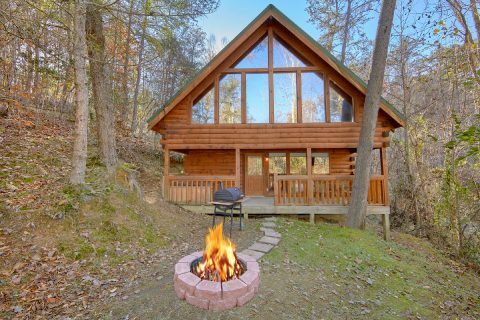 The cabin was a quaint, quiet, secluded cabin in the woods and served our purpose of having a weekend get-away. I did not like the electric fireplaces in the living area and master bedroom. I want the heat of a fireplace, not just the ambience. Although the back yard area was not a very spacious area, we think the area could be landscaped a little better. The backyard area is not kid-friendly as there is a big drop off but it works for adults. Overall we did enjoy our weekend and this cabin is def secluded and not stacked on top of other cabins - we did like that! I thoroughly enjoyed my stay and so did my group I was with. The cabin was clean and as beautiful as advertised. The amenities all worked great and the location could not have been better. It felt like home all weekend and I would definitely consider going back there very soon.